You have already spent a lot of money on the training of your employees and your internal trainers? At the same time, you feel as though any effects do not last long enough? You feel like every year, you need to invest in new trainings and further education? This is about to change. If you invest into the design of trainings, you can gain even more. How is the day-to-day business? Oftentimes, one realises that there is something wrong when one tries to define the problem. The development of training absolutely contributes to the clarification of contents; this I have seen time and time again. My work creates the basis with which everything will go in the right direction and resources are used appropriately and sustainably. You will get actively involved employees, which have real fun in trainings – that is how sustainability works! 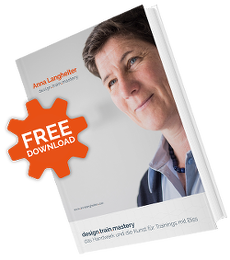 design∙train∙mastery is the absolute win for you entire company. What could be better than to combine internal know-how of your company with external practical experience and knowledge of designing trainings for the most optimised and sustainable execution? There is nothing better. Any training can be prepared perfectly, but what counts in the end is that the trainer makes all the difference. In order to lift your trainers into the league of top-trainers of your company, I give them the necessary tools to achieve this goal. With me, trainers get the best possible support they need in order to do an excellent job as company-internal trainers – by measures of context as well as their training skills. They get the tools on how to deal with difficult situations and participants. Internal trainers not only receive the necessary skills for an excellent training, but they can also use these soft skills as colleagues and leaders in the company at any time. Do you have any burning questions? I support you with the analysis of the current situation, the clarification of the next steps and the creation of tailor-made trainings.